The Research & Development (R&D) field faces a serious crisis. The development and approval of novel drugs has slowed down dramatically over time despite an ever growing mountain of biological knowledge. At the same time, the costs of R&D have skyrocketed. In the United States, for example, the average cost until market entry of a new drug is now at 3.8 billion US Dollars. Other countries show a similarly low success rate in the face of sky-rocketing R&D costs. EFFICACY and SAFETY are the two key factors that determine a successful pharmaceutical outcome, but severe deficiencies in both are the culprits for the current crisis. The observed efficacy is often much lower than the expected one because an alarming disconnect between preclinical and clinical trials exists. Low reproducibility of preclinical experiments, statistical flaws, and a strong publication bias towards positive data worsen the problem. As a result, many allegedly promising drug candidates don’t make it through phase I or phase II of clinical testing because they don’t have a strong benefit-to-risk ratio and because unwanted side effects, of course, weigh heavier when the desired treatment effect doesn’t occur. Decline of productivity in the pharmaceutical industry from 1950 until 2010. 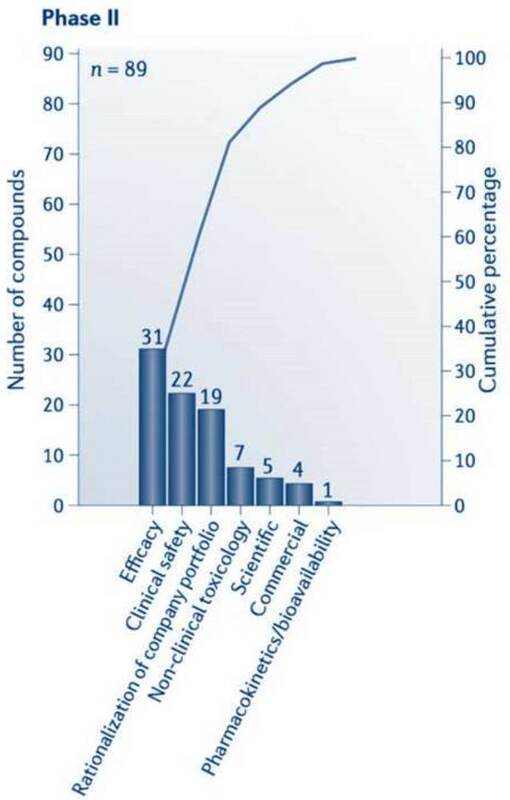 Using a logarithmic scale on the y-axis, this graph illustrates the number of new drugs approved per year and per billion US Dollars spent on Research and Development (R&D). Source: Scannell et al. (2012), Nat Rev Drug Discov, vol. 11, pp. 191–200. The obvious benefit of drug repurposing is a much lower overall risk because potential side effects are already known. In addition, it takes less time and money because important details, such as the best route of administration, the best vehicle, pharmacokinetics, maximum dosage etc. are (in most cases) already known. However, up to 60% of all preclinical data are not reproducible. So the most important challenge remains: To validate that an intended drug target is mechanistically involved in a certain disease and that the repurposed drug will be effective. Without that knowledge it would be like playing dice in the dark. This is where our innovative approach of high-standard literature review & in silico drug repurposing comes into play, before the most promising drug candidates will enter well-planned preclinical animal studies, and eventually be tested on actual patients.